Naughty Dog reveals a sequel to The Last of Us has a 50% chance of happening, and that Sony has given the studio complete freedom if it wants to create a follow-up or not. While a Brazilian website claims The Last of Us 2 is already in production and is set for a 2015 release, studio Naughty Dog has yet to confirm the sequel's existence other than it's "being considered." As it stands, the chances of us seeing a follow-up is at best, a 50% chance, according to senior studio staff. 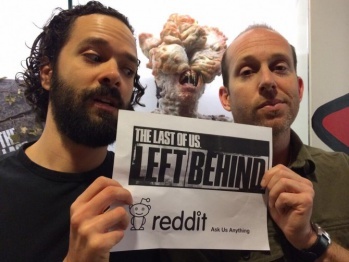 During an AMA (Ask Me Anything) session on Reddit, The Last of Us Creative Director Neil Druckmann and Game Director Bruce Stanley fielded questions from fans about the title's DLC, Left Behind, and talks inevitably turned to the much-anticipated sequel. According to Druckmann, there's a 50/50 chance of a sequel happening, stating, "If you're asking about a sequel... right now I'd say it's 50/50." In the same Q&A session, Druckmann also revealed that even with The Last of Us being a commercial hit for Sony, the publisher is not forcing the studio to develop a sequel and is giving it complete freedom in what it wants to create next. "Sony has complete trust in us. It's really up to us to come up with something that will keep the team inspired for the next several years - which is why we don't take the decision of what we'll work on next lightly," Druckmann notes. So, there you have it, folks. We might or might not get a sequel to The Last of Us. As someone who loved the action-adventure game, I'm conflicted. On one hand, The Last of Us was just so good that I really want to see more what Naughty Dog can do in the universe; but on the other, it might be the sort of game that's perfect being a "one-off" and letting our imaginations do the rest of the legwork. Would you want to see a sequel? Or did the game end the way it should and Naughty Dog would just be better off creating a new franchise altogether?